WITH APOLOGIES for the short notice - because, alas, the Newsletter is late again - please get next Saturday, 16 October, in your diaries now. That's when we shall be doing our annual BULB PLANTING - this year at the top of King Georges Road, Bishopsworth, at its junction with Highridge Road. Meet at 10.00am, and bring a trowel or spade if you can - but come anyway if you can't! Good news from Manor Woods. On page 4 you can read about the splendid 'Booted-up Bristol' event which recently took place, but there is also exciting news to come (shortly, we hope, but as it all depends on the City Council's timetable, things may drift a little ...). We were recently contacted by Sally Oldfield at the Council, who has been investigating what areas in Bristol should be designated as LOCAL NATURE RESERVES. There are four in Bristol at present (including Stockwood Open Space which we visited a while back), and the intention is to identify three more. Manor Woods is earmarked for designation, and Sally hopes this will be confirmed in the next month or two. At her request, some of us took Sally on a guided walk of Manor Woods to show her what we thought made it so special, and she has agreed to tell us about her work as Local Nature Reserve Officer at our next A.G.M. We also hope to have news shortly about work being done to improve the path through the woodland - more next time, perhaps. Less good news on the planning front. The application for the WITHYWOOD CENTRE which we oppose (see page 3 of the last Newsletter) goes to the South & East Development Control Committee next week. Improvements have been made to the design, but it still isn't good enough and we continue - reluctantly - to oppose it. 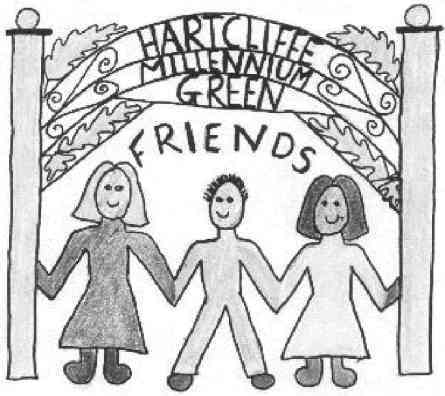 HARTCLIFFE MILLENNIUM GREEN has recently undergone a facelift and has a new play area for young people aged 8 to 14, an improved events lawn, rebuilt amphitheatre and a new landscaped seating area. The new play area includes a range of challenging play equipment, which was chosen by young people from the Hartcliffe area. The rebuilding of the amphitheatre has involved replacing plastic uprights, which were damaged through vandalism, with stone alternatives made from a similar material to roadside kerb. The new landscaped seating area has been designed and built by CSV Environment. All of these enhancements have been funded with grants from the South Bristol URBAN II European Regional Development Fund and the Playing Fields and Community Green Spaces Programme run by Sport England on behalf of the New Opportunities Fund. The Green benefited in August from Noise Project volunteers who helped paint fences and undertake a thorough litter pick of the green. The Friends of Hartcliffe Millennium Green held two BBQ's on the site and have undertaken regular maintenance and gardening works which have resulted in a beautiful floral display all summer long in the rockery garden. Children from the 'Kicking Spaces' project spent a day over the summer holidays on the Green playing environmental games organised through the CSV 'Out to Play' project. For details of how to volunteer on the Green or of upcoming events and activities contact Oliver Roberts, Millennium Green Project Officer on (0117) 377 6223. Or write to Hartcliffe Community Campus, Room 2.16, City of Bristol College, Bishport Avenue, Hartcliffe, Bristol, BS13 0RJ. E-mail office@hccampus.fsnet.co.uk. 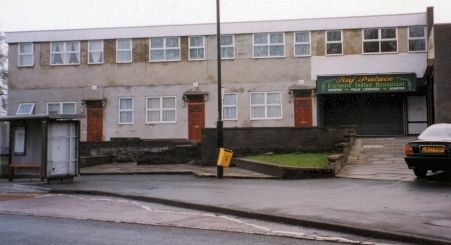 THE 'MATTIES BLOCK' is what many local people who remember its previous incarnation call The Parade, Church Road, Bishopsworth (see photo below). A lot of you will have walked past it regularly since most of the building was turned into flats a few years ago and despaired about the state of the surroundings: loose breeze blocks, dilapidated walls and litter. The site is in the heart of the Bishopsworth & Malago Conservation Area, opposite the church and close to many local amenities. A few weeks ago several of us decided to take action. Previous attempts to solve the problem had failed. One of us had the idea of taking photos which we sent to the Health and Safety team in the Council. The response was very swift and sympathetic and an officer visited a few days later. She confirmed the situation had to be tackled. The latest news is that the owner of the property has now been tracked down and contacted. A meeting of Council employees and the owner is to take place in a few weeks to discuss improvements. In the meantime the steps have been made safe. We will keep our fingers crossed, hoping that these ugly photos will soon be only a memory. 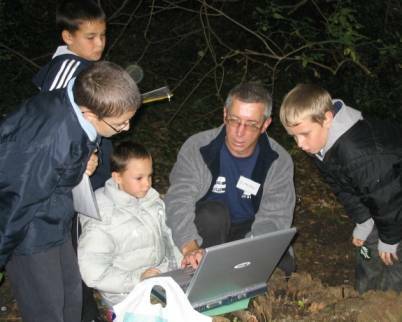 LEARNING THROUGH FIELDWORK is the theme of this innovative project which was run on Tuesday 28 September in Manor Woods with thirty Year 6 children from Connaught Primary School. Organised by Kathy Derrick of Bristol Living Rivers, other organisations involved were Bristol Parks, Bristol Museum, THE-i City Learning Centre and, of course, Malago Valley Conservation Group. This was only the second time this project had been run, the previous occasion being on the Trym at Blaise. The day before the event, I went to the school, along with Kathy and the leaders of each of the three activities, to brief the children on Manor Woods and on what they would be doing. I also took along a copy of My Manor Woods Book for each child which Kathy had bought for their use. 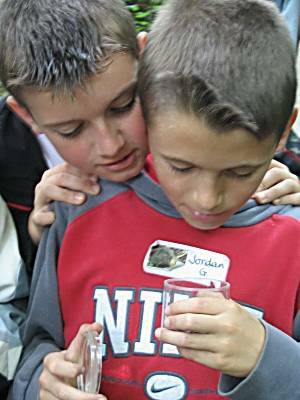 The activities were sampling the Malago stream, measuring its profile and looking for minibeasties in the water; identifying leaves, trees and creepy-crawlies in the woodland; and taking photographs of the streamside, the woodland, and using macro (big close-ups). The children will later vote for which photos they want to enter for the national 'Young Photographer of the Year' event. I was extremely impressed with the quality of equipment the children were given to use - really serious cameras, data-loggers etc. - with all the observations recorded on laptop computers running a purpose-made spreadsheet. The thirty children worked in three groups of ten which took it in turns to do each event. Crossways Tabernacle kindly allowed the use of their basement which was a splendid base, providing a large space for briefing and reporting back, meal breaks, toilets etc. So why 'Booted-up Bristol'? Because this sort of activity combines booting up both the participants - to go wading in the stream - and the computers they record their work on! The whole day was a great success and we hope that more schools will make use of Manor Woods for this sort of hands-on, crosscurricular learning. THIS DRAMATIC PHOTO was taken by Angela James in her garden one night in June. A gang (swarm? herd?) 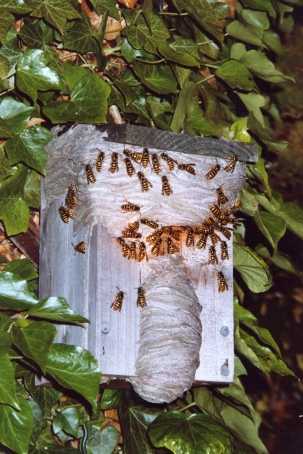 of WASPS had colonised one of her bird-boxes. She wisely left them to their own devices and they were all gone by August. Much more recently, André Coutanche was working at home one morning when a loud bang came from just outside. A SPARROWHAWK had landed in the back garden with a very dead collared dove which it proceeded to devour. All that was left was a pile of feathers - and the seeds which the dove had eaten for its last meal. Please tell us about your wild BS13! CANS for recycling continue to arrive at 14 Queens Road, where the enthusiastic (most of the time) Can-Sorter-in-Chief separates the aluminium from the steel. However, she notes that there haven't been quite as many as usual lately, and asks everyone to remember that we welcome all contributions! 'ACTIVE LIFE' and 'Walking the Way to Health' have teamed up to bring you the 5 x 30 walks programme. This will help you achieve your 5 x 30 minutes of exercise that you need each week to keep healthy. There will be a walk every weekday morning, which lasts around 30 minutes. Each one will take in some of the green spaces the BS13 area has to offer, while still being fairly flat and easy to walk on. Most of the walks are suitable for wheelchairs and pushchairs. All walks are FREE of charge! For further information and details of walks, please contact Kate Cooke on (0117) 964 0504 or 07795 315285. The programme is funded by the Hartcliffe and Withywood Community Partnership and supported by the South West Regional Development Agency. The City Council operates a 24 hour 365 days of the year emergency call out service. OUR 'WINTER' series of meetings starts in October on the usual third Tuesday of the month (except November), meeting at St Peter's Rooms (by the side of St Peter's Church, Bishopsworth). Saturday 16 October: Bulb Planting on the green triangle at the junction of King Georges Road and Highridge Road. Meet at 10.00am and - if you can - bring a trowel or spade. Tuesday 19 October: Spacemakers, a talk by MARK ROONEY about this innovative scheme to involve young people in improving our environment. The project has worked with a group of twelve young people from the Hartcliffe and Withywood estates for the past two years. The project began with an education programme and progressed to a project design phase with a landscape architect to develop the group's ideas for a new high quality public space in Hartcliffe. 7.30pm at St Peter's Rooms. Monday 25 October: Garbage Raid. Meet at 3.45pm at the 'Elm Tree'. Tuesday 16 November: The silly and super Bishopsworth Quiz. As usual, if you would like to attend, please let André know so that we can inform the British Legion. Meet at the Royal British Legion, Manor Road, Bishopsworth, by 7.30pm. THURSDAY 18 November (note the change of day to avoid clashing with the Quiz): LES DAVIES, Warden of the Mendip Hills Area of Outstanding Natural Beauty, will talk about his work. 7.30pm at St Peter's Rooms. Friday 26 November: Christmas 'At Home'. 2.00-5.00pm at 23 Grange Road. Saturday 27 November: Christmas 'At Home'. 10.00am-12.30pm at 23 Grange Road. SEE THE BACK PAGE FOR MORE DETAILS. Monday 29 November: Garbage Raid. Meet at 3.45pm at Withywood Post Office, Four Acres. Tuesday 7 December: M.V.C.G. 's inimitable Christmas Party. The editor wishes to make it clear that he hasn't a clue what is planned, but has been instructed to ask everyone to bring a terracotta flowerpot if they can. The pot should be 10-12cm high (that's 4½") and with a diameter at the top of 9-11cm (4"). CHRISTMAS is coming - and therefore so is our CHRISTMAS 'AT HOME'. The system last year of two half-days worked well, so we are continuing it this year, this time enjoying the kind hospitality of Chris Lillington at 23 Grange Road. It will be the traditional mixture of coffee, chat and lots of nice things to buy for Christmas presents, with the money raised going to Malago Valley Conservation Group, the University of Withywood and the Wildlife Trust. Come to 23 Grange Road on Friday 26 November between 2.00 and 5.00pm and/or Saturday 27 November between 10.00am and 12.30pm.